Put the sparkle back in your vehicle's paint with BLACKFIRE! The BLACKFIRE Porter Cable Swirl Remover Kit combines the proven polishing technology of BLACKFIRE Scratch Resistant Clear Compound and Finishing Polish with the safe, steady motion of the Porter Cable polisher. The Porter Cable 7424XP Dual Action Polisher is a beefed up, more powerful version of our most popular dual action polisher. The Porter Cable 7424XP Dual Action Polisher has all the user-friendly features of the original Porter Cable 7424, but a 4.5 amp motor enables enhanced performance and durability. The Porter Cable 7424XP Dual Action Polisher operates from 2,500 OPM to 6,800 OPM to provide a faster removal rate. The 7424XP features all ball and roller bearing construction with spiral/bevel gears and an improved switch design. The buffer accepts a 5/16-24 spindle thread. The pad diameter is 6 inches. The polisher includes a wrench, counterweight installed, side handle, polishing pad, and a operating manual. BLACKFIRE Polish uses nano-abrasives to remove 2500-3000 grit sanding marks on fresh paints and to correct mild imperfections on cured paints. These fine abrasives burnish the finish to an incredible gloss! BLACKFIRE Polish can be used to refine the paint after compounding or as a one-step shine enhancing polish. 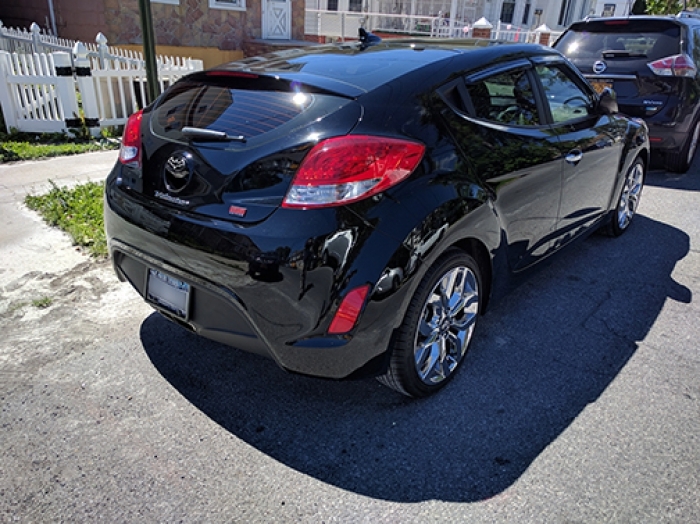 BLACKFIRE Synthetic Spray Wax creates a long lasting shine with a high concentration of BLACKFIRE�s amazing tri-polymer Wet Diamond polymers. This spray-on paint sealant contains light cleaners to remove dust and smudges while reinforcing and extending existing paint protection. Use it over waxes or paint sealants to maintain a fresh, clean shine all the time! Each bottle of BLACKFIRE Synthetic Spray Wax is packed with Wet Diamond polymers making this an excellent stand-alone sealant as well! When used with the proper polishing compounds, this orange pad removes 2000 grit sanding traces, swirls and paint defects with minimal or no surface dullness. This pad creates so little haze that you can often go from compounding right to finishing without the intermediate polishing steps. Where polishing is still required (often on black and red cars), it can be accomplished in a fraction of the time it would take with standard pads. Use this pad and polishing compound to remove swirls, water spots, and fine scratches. The most often used pad. This pad has a mild cutting (cleaning) action and should be used to apply light compounds, polishes and one-step, cleaner/waxes. Use this White CCS Polishing Pad to apply one-step, polish/sealants. Retail value of the kit is $354.71, giving you a savings of $74.72! Please call 844-216-3966 for an expedited shipping quote on this item. ProsGreat polisher, any person can use it even if your a beginner. With the different pads you get it makes for a great purchase along with the compound and polish.